Mom, the Intern: Once upon a time. Heeeeeeeey friends! I'm back! I survived another high-energy, thrilling, EXHAUSTING EVMCO concert! Thank you to all who came out to support us -- I hope we rocked your world. And if you couldn't make it, I'm sorry! You really missed an amazing show. But don't worry -- future concerts are on the horizon. I'll be sure to keep you posted, of course. I've decided to run a new series of posts which I shall lovingly title, "Once Upon a Time ...." They will feature an old picture and a (likely embarrassing) story associated with said picture. I've done something like this in the past but never gave the posts an official name. Depending on how well it goes, I may create a button for it and have you link up and play along!!!!!!!! Whoa, whoa. An official link-up? I think I'm getting ahead of myself here. Anyway, here's the picture. Prepare to laugh yourself silly. 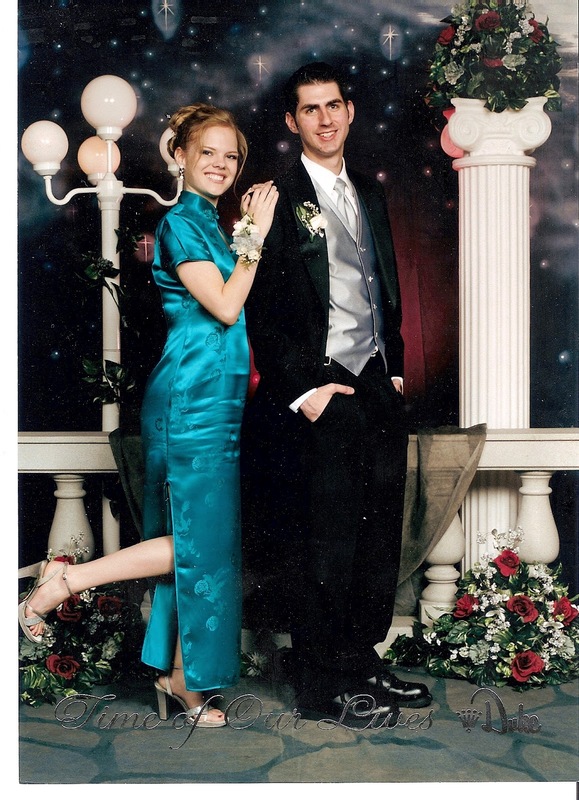 Once upon a time ... it was May 2005 and I was a senior in high school, dating a 22-year-old guy. 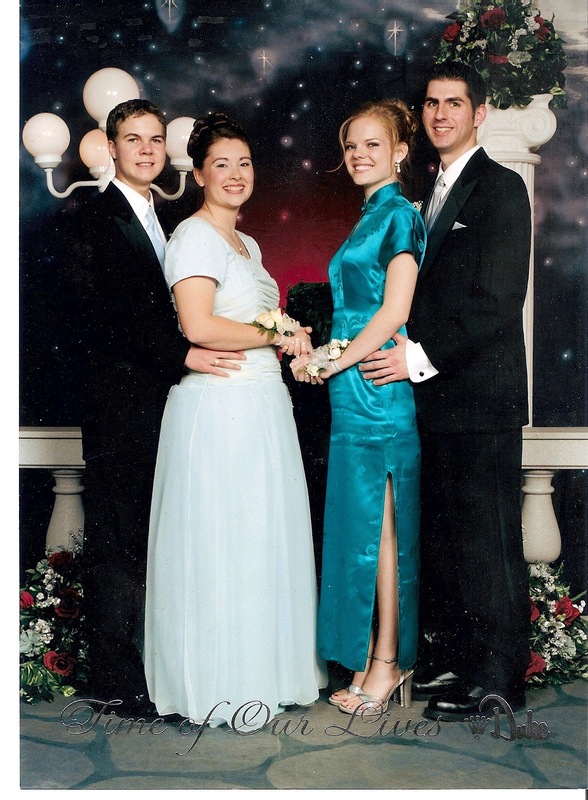 I've already elaborated on how awkward that was at times, but it became espeeeeeecially awkward when Prom season rolled around. I wasn't even sure I wanted to go, but I felt obligated, being a super-cool senior and all. Plus, who doesn't like getting all fixed up to go dancing at some overpriced venue with a bunch of sweaty teenagers? So Dill and I talked about it and decided, what the hey! Let's go to Prom! Never mind the fact he'd graduated four years prior to that. But it was a non-issue. I mean, look at that face -- he could still easily pass for a teenager. Seriously. I purchased a teal green (check out my school spirit!) Chinese dress in none other than Chinatown, San Francisco, while my choir was on tour there. On a total whim. Walked into a dress shop and walked out with that sassy number. I honestly don't know what I was thinking -- maybe part of me wanted to appear like I was too cool to care. Alternative. Hipster, if you will. Which I was. (Not.) However, Dill kind of ruined that appearance for me by donning a real-life tux, complete with a satin vest and matching tie. Even a fancy square of fabric in the pocket. AND CUFFLINKS. Clearly, there was a miscommunication there. Alas, we went to Prom. We got each other matching flowers. We even went with another couple, as is a customary dating practice in Mormon culture (see above poorly-scanned image). We dined at the too-expensive Cheesecake Factory and ordered separate entrees, even though we were beyond stuffed halfway through. Of course, we ate cheesecake, and it was goooood. We also stole away to the bar for a bit to watch the Phoenix Suns in action (it was the playoffs!). And I will never forget how we got lost in the shadier parts of Phoenix on our way to the dance. The dance which cost Dill 100 dollars for us to attend, might I add. Looking back, we laugh at how silly we were to even bother going. Things are vastly different now. We are tightwads and also parents. IF we go to the Cheesecake Factory, it's because we have a gift card (Number 1) and then we share a main course so we can splurge on cheesecake. We'd never pay money to listen to Top 40 hits while hanging out with friends in formal wear (proof: we skipped out on Dill's 10-year reunion last year). And actually, when we ARE lucky enough to have a night to ourselves, we usually put on our unsightly "comfies" (my word for pajamas), crash on the bed and watch Netflix while munching on popcorn. We're klassy like that. I guess my Senior Prom was a rite of passage, one I'm now glad to say I took. If only to say I did it. And to show the world the embarrassing photographic evidence, of course. we are almost twins, i swear! hahaha. i was too dating my husband in highschool and we thought about going to prom together, but alas we did not. what was awkward was the fact that 2 weeks before we met him i was asked to prom to a different school so i went with this guy, and my then boyfriend now hubby was there when i left with this other guy. it was totally weird. hahaha. loved your story! you two are adorable! Hahaha, me and jon are about the same distance in age as you and Dill, we considered me doing the prom thing, but having just had a baby i opted out. ps- you totally pull off the dress tho- don't deny it! I love the post idea, it's different than the others out there. I'd link up (and I NEVER link up to those things). It amazes me how expensive prom is! Maybe I'll blog about my experience someday. But oy, glad to have those days over, ya know? I can't believe he took you to Prom at 22. He must have loved you A LOT.